As a Young Audiences volunteer, I’ve been fortunate enough to watch a variety of artists at work in the classroom. And the results always amaze and humble me. Whether it’s rapping the multiplication tables, or acting out a storyline, or drawing to illustrate a book’s theme(s), I love how the arts grab kids’ attention and not only hold it, but draw them out, asking questions, trying out new ideas, and expanding their horizons. But it dawned on me that I had never watched a class in its entirety–had never witnessed the full lesson plan. I finally got a chance to do so recently when I visited Ms. Bradley’s eighth-grade Honors English class at Chesapeake Science Point Charter School in Hanover, Maryland. Over the course of a week, Gayle Danley, an internationally recognized slam poet, was there to guide them in writing their own poems. Full disclosure: Gayle is a personal friend of mine. I met her five years ago when she mentored my daughter, Colette, who had been asked to speak at Young Audiences’ annual Impact Breakfast. And over the years, I have watched her perform at YA events and in her own shows. But I had not yet witnessed her in action in the classroom. And so, I found an inconspicuous spot from which to observe. Gayle quickly got to the heart of the lesson. She had started working with the class on Monday, so she now asked for volunteers to read the poems they had written since then. She instructed them to listen carefully and write down two things: 1) a sentence or phrase they really liked; that they could truly identify with and 2) a sentence or phrase they didn’t like or didn’t understand. And so she read. Sometimes Gayle interrupted to ask her to slow down or to speak louder. 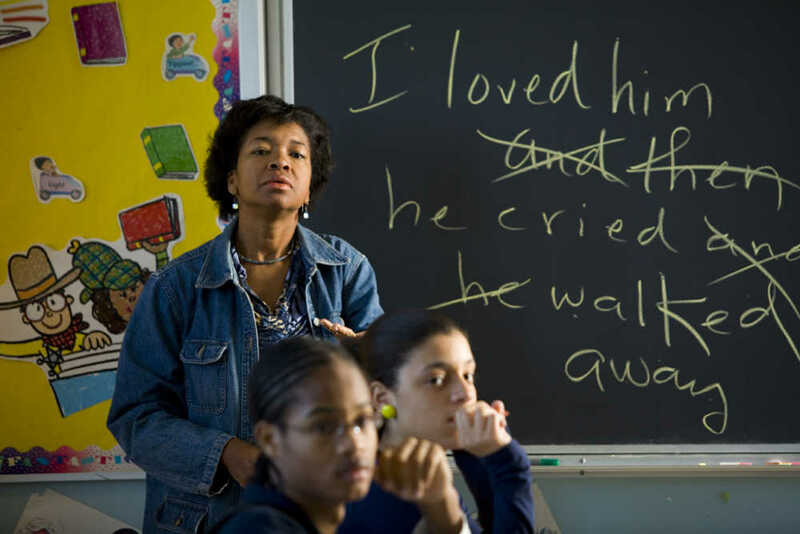 Another time she stopped her to ask the class what they thought of one line, “how does that make you feel?” When the teenager had finished, Gayle again led the applause and praised her for being first. And so, being honest, I answered that I had actually liked that because it made me truly pause on that word and think about it. Hopefully, that was a good teaching moment about how unique poetry is and that your own personal experience will guide your interpretation! 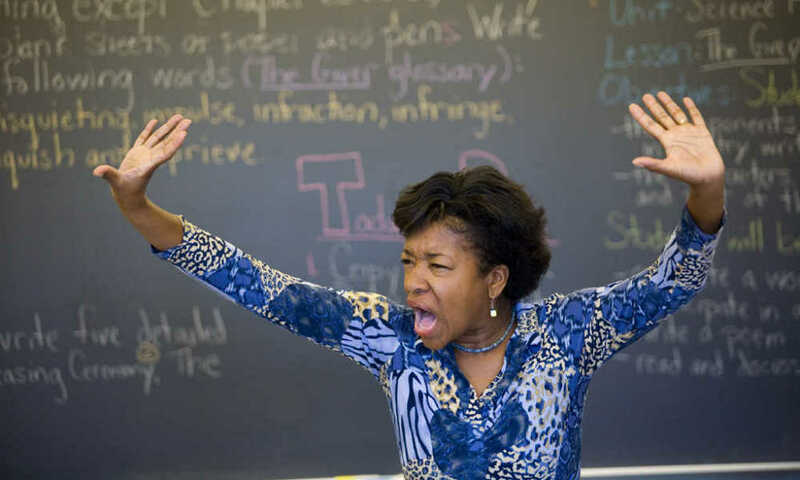 Back at the front of the classroom, Gayle pointed to words that were written on the board: Wring, Fling, Bling, Sing. “Let’s talk about these for a while.” And for the uninitiated (as I was), Gayle describes this as her writing process. Wring: Wring the words out onto the paper like you’re wringing out a washcloth. Just write it down! Fling: Once it’s on paper, fling out any words that aren’t needed. Bling: Now, add words that will really make your meaning stand out. Sing: Finally, read it aloud and see how it sounds. Fling or Bling as needed. As she described this, I laughed internally because I recognized my own writing process. Except I had always described it (skip this part if you’re squeamish) as the vomit method. Throw it up on the paper and clean it up later. Leave it to a poet to be, well, more poetic about it! “His color was dangerous,” Gayle repeated from another poet. “What is dangerous?” she asked the teens. “A knife!” “A gun!” “A wild animal!” And with those words, she suggested illustrating the danger more concretely with a visual image that would strike the listener/reader. As the lesson wound down, I gathered my things to leave. Did I mention there are no observers in this classroom? At the beginning of the lesson, the teacher had explained what she was looking for in an assignment that talked about regional differences and dialects in language. Before I could exit, I found myself surrounded by a group of three girls who asked me where I was from (North Carolina), how did I pronounce “pecan” (accent on the second syllable), what word do I use that generally isn’t used in other parts of the country (y’all). Signing off on their papers, I felt excited to be a part of their education even in such a small way, inspired to try this on my own, and happy to be a tiny part of Young Audiences’ mission to reach kids through arts-integrated education. With Gayle’s teaching style demonstrated, I am ready to Wring, Fling, Bling, and Sing on my own! As a pair of dancers performed, a group of elementary school children sat, crisscross applesauce, watching their every move. 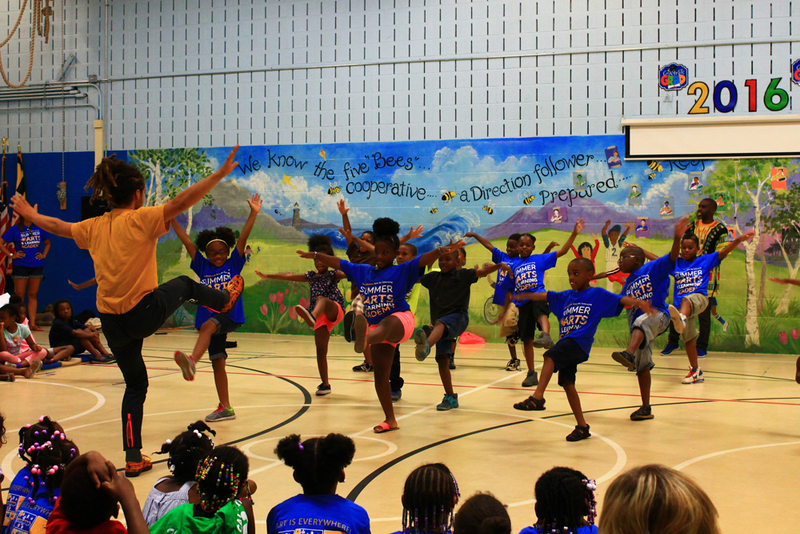 Valerie Branch, a dancer and choreographer with Young Audiences had been working with the Belle Grove Elementary students in an artist residency made possible through the Arts Empowered Minds Initiative (AEMI). When the last notes faded away, Valerie asked the children what they had observed. “They love each other,” one child offered. “They share,” another chimed in. 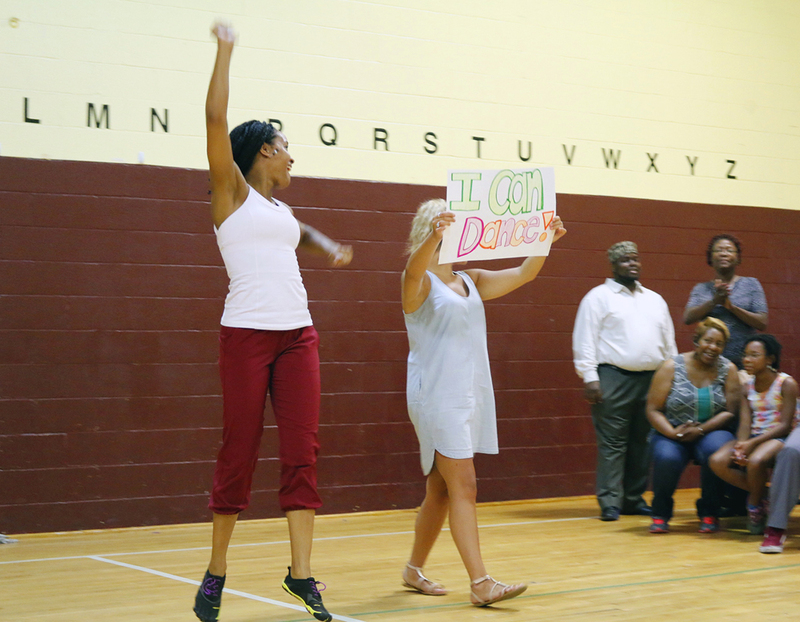 Valerie Branch and a student from Belle Grove Elementary School demonstrating a “weight bearing” dance technique for the audience. Then she asked the kids to explain what dancing techniques they had witnessed. “Negative space,” “weight sharing,” and “weight bearing” were some of the answers shouted out. Next, she gathered a group of her second-grade students to pair off with each other to demonstrate some of those concepts. Once the children had done so, half of the students were instructed to use a frozen pose in a high, medium, or low position. The rest were to react to whatever their partner had created. With the new poses in place, she asked the other children in the assembly to discuss what they saw and how the partners had related to one another. 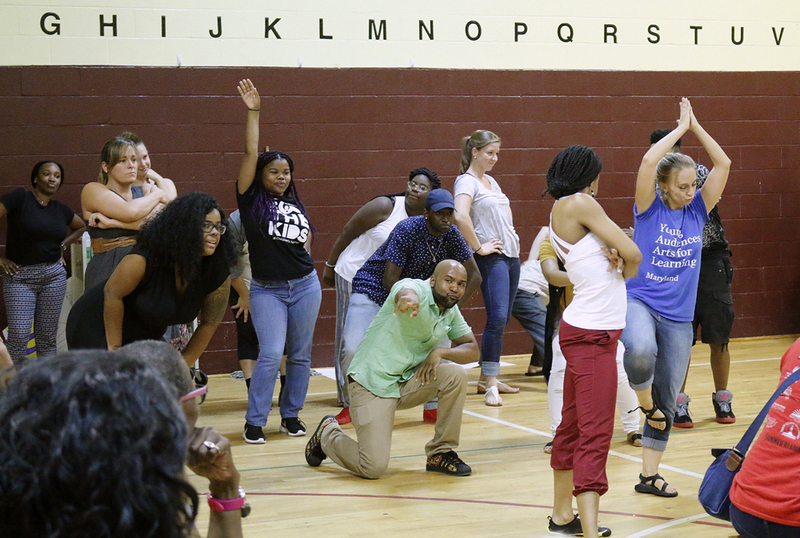 And, in true arts integration form, this exercise was not just about learning dance terminology and positions, but was tied to lessons at the school. This particular one was used in conjunction with a poetry-writing assignment in which the children described themselves through the creation of “I am” poems. Later, choreography was added to illustrate their autobiographical poetry. Such was the back-and-forth learning that observers witnessed at the Arts Empowered Minds Announcement Event and Celebration on Friday, March 8. 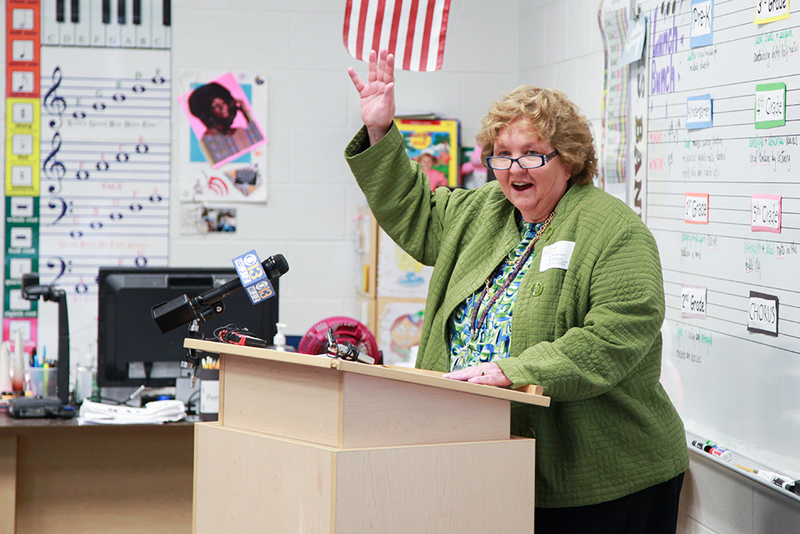 The group of educators, politicians, state and local arts administrators, and volunteers gathered at the school was celebrating a $100,000 grant from the National Endowment for the Arts (NEA), which will be used to expand arts integration and teacher professional development in Northern Anne Arundel County. Now in its third year, AEMI has already racked up an impressive set of statistics. But even better than the numbers are the inspiring stories that teachers and administrators had to share during the event. Brittany Roger, a teaching artist with a scientific illustration background, spoke of bringing exotic animals (Madagascar hissing cockroaches, iguanas, corn snakes) to the classroom and allowing children to explore the creatures through sight, sound, touch, and smell. Afterward, the students draw and sketch the animals based on their observations. Amy Goodman, who heads the math department at North County High School, told of her department’s initial skepticism about linking arts and math together. 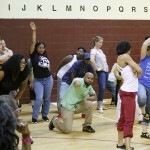 But as the teachers learned arts integration techniques and applied them in the classroom, they began to see students who had been turned off or struggling with math begin to make connections that helped them grasp the concepts they needed to learn. And so, step by step, AEMI partners create opportunities for children to learn through the arts. Step by step, the Initiative changes minds about the importance of integrating the arts with reading, ‘riting and ‘rithmetic. And, step by step, it makes converts of those who witness how the arts engage young minds and help them stay, not only focused on their education, but truly inspired to learn. 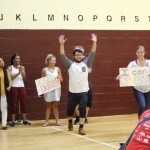 Learn more about the Arts Empowered Minds Initiative, its collective impact partners and the community it serves by visiting artsempoweredminds.org. Arts Integration: 1 + 2 = Fun! When I was studying for exams in college, I would often create a strong visual image to help me remember test items. For example – the 6 C’s of credit? Character, capacity, capital, condition, collateral, cash flow. And while these concepts didn’t flow naturally through my brain, the image I created did. There was a guy (character) leaning on a crutch (condition) with a cap on (capacity) standing in front of the Capitol Dome (capital) with a briefcase (collateral) full of dollar bills (cash flow). At the time I didn’t have a name for my study method – I just knew it worked for me. Years later I can now identify this as arts integration with an emphasis on a visual learning style. And so I felt very at home as I toured Young Audiences’ Summer Arts & Learning Academy (SALA) at Lyndhurst Elementary/Middle School in Baltimore. That’s because each classroom was filled with young students learning in a variety of arts-integrated formats. I witnessed drama, rap songs, textile art, drawings, and writing—all used in conjunction with classwork such as a math problem or a reading assignment. And while I knew, and the teachers knew, that these children were involved in thoughtful, hard work here—the serious business of arresting summer learning loss—the kids were focused on how much fun learning was. 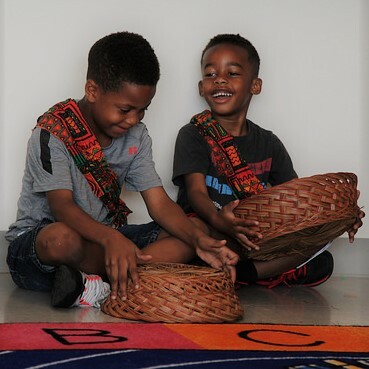 For example, in the PreK classroom, YA roster artist Mama Rashida of WombWork Productions and her teacher partner, Samantha Amey, worked with the students on a basic math problem: 1 + 2 = 3. Now, of course, you can force your brain to learn this by sheer rote repetition, but let’s face it. How exciting is that? But if you illustrate it with a story about the marketplace where you must buy one fruit (fruit sellers stand here to the right!) and then move on to the vegetable stalls where you need a tomato and a carrot (veggie vendors over here, please! ), you set the stage for a fun learning experience. As the kids moved excitedly from place to place to “fill” their baskets or “sell” their wares, the teacher illustrated what they were doing on the whiteboard. With their “shopping” completed, the children returned to their seats and began to answer questions about the math problem. At this point, the teacher pretended to be confused and wrote wrong answers on the board. As the children rushed to correct her, she had them explain what was wrong, until everyone agreed that the proper answer was three. No, this wasn’t bored voices droning “1 + 1 = 2,” “2 + 2 = 4.” Instead, these were kids excited about math, happy to supply the correct answer to a befuddled teacher and eager to learn more! But what about English? A little later I stepped into a first-grade classroom where students were studying Charlotte’s Web. Here, I found a mix of visual art and drama being used to tell the story. Several children took turns at the front of the classroom with a drawing they had made. After displaying it, they then acted out that portion in mime. Initially, the teacher set the scene, reminding the kids what was happening in the story at this point. After the child was done, the teacher asked the other students what they had observed as their classmate portrayed the scene. 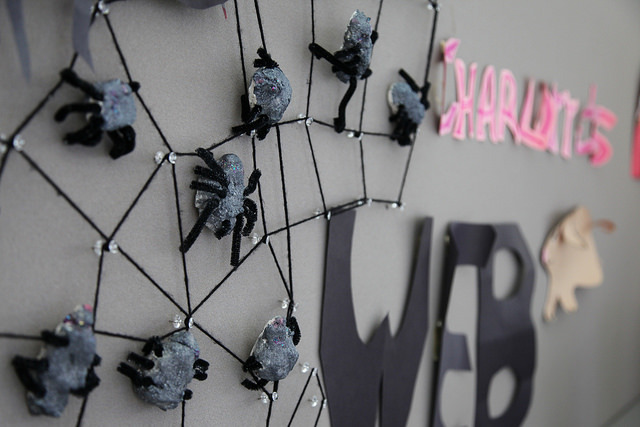 Later, I noticed a bulletin board filled with tiny spiders made using a modified papier mache technique, with pipe cleaner legs. As I looked at this, one young girl came up to me and proudly told me about the paper collages they had made to illustrate what the barnyard looked like. “They’re displayed outside the classroom. You have to see them!” Indeed, I did, and when I left, I enjoyed all the bright, cheery artwork that surrounded the door frame. My next stop was a mixed class of second, third, and fourth graders who were working on both how to solve for an unknown number in a math problem and the nine’s in the multiplication table. And here is where I definitely appreciated the arts-integrated approach. I remember learning the nine’s and, oh, how I despised them. But nobody seemed to hate nine’s here. Maybe that’s because as they chanted this portion of the multiplication table, not only did they give it a fun rap slant, but other classmates accompanied the song with percussion instruments. Why couldn’t they have done that when I was in school? My final stop was to a fourth-grade classroom where the lesson was to reinforce the basic math operations: addition, subtraction, multiplication, division. Here, too, I felt very at home, but this time it was because not only did I recognize the teaching artist, YA roster artist Femi the DriFish, who I’ve witnessed teaching on several occasions, but I actually recognized kids whom I had seen before. This heightened my sense of how compelling arts-integrated learning is in capturing kids’ imaginations, so much so that they return for another summer of learning! They rapped their way through a popular song remixed to describe math operations terms in word problems (equals to, divided by, times, added to, subtracted from, etc.) in preparation to shoot their own music video. As they practiced, I wondered what they would take away with them after this summer. Would they remember these lyrics and hum them in their head as they take a math quiz next year? Will they think about a marketplace full of vegetables and fruits and how math filled their baskets? Perhaps they’ll draw a picture that will help them recall the story they’re reading in class. But most of all, will they remember the fun that accompanied all these math and English concepts? And that 1 + 2 = 3? I think so. And this funny little guy, leaning on his crutch with his cap, briefcase and dollar bills, standing in front of the Capitol agrees with me! Learn more about our mission, our methods, and our future plans during a one-hour Meet Young Audiences event. In addition to hearing from the organization’s leaders and getting an inside look into the amazing work we are doing around the state, one of our roster artists will share their amazing work with you and speak about how the arts complements and enriches classroom learning. Please reach out to Ingrid Murray, Individual Giving Manager, at ingrid@yamd.org for more information or call (410) 837-7577 x. 107. Interested in hosting your own Meet Young Audiences event? Find out more here! Children have a lot to say. 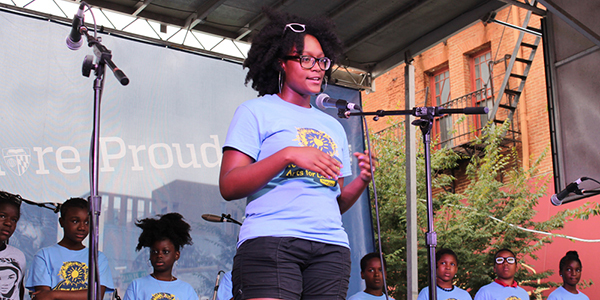 Slam Poet and YA teaching artist Femi the Drifish worked with students in last year’s Summer Arts & Learning Academy to help them get their poem to the stage for all of Artscape to hear. We are proud to share this light, energy, and love for our city, straight from the mouths, hearts, and minds of the future of our nation. 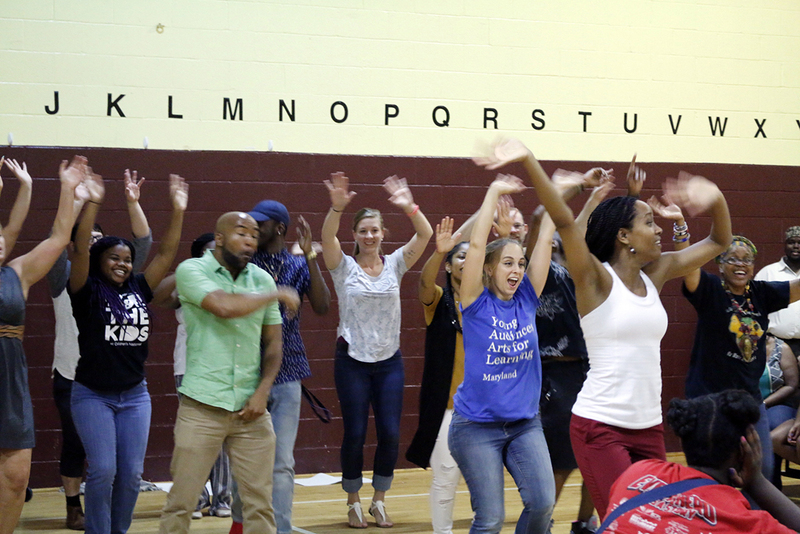 The Arts Empowered Minds Initiative (AEMI) is aimed at ensuring equitable access to the arts for Northern Anne Arundel County Public Schools through in-school arts integration, out-of-school arts programming, and professional development for teachers. Now in its second year, the initiative has been expanded to include all twelve schools in the region thanks to generous funding from the National Endowment for the Arts! Notable among the additional schools is the North County High School (NCHS). All students in every other school impacted by AEMI are zoned to complete their secondary education at this high school. North County High School’s new designation as an AEMI school will enable local students to continue their learning through arts integration throughout their school years. 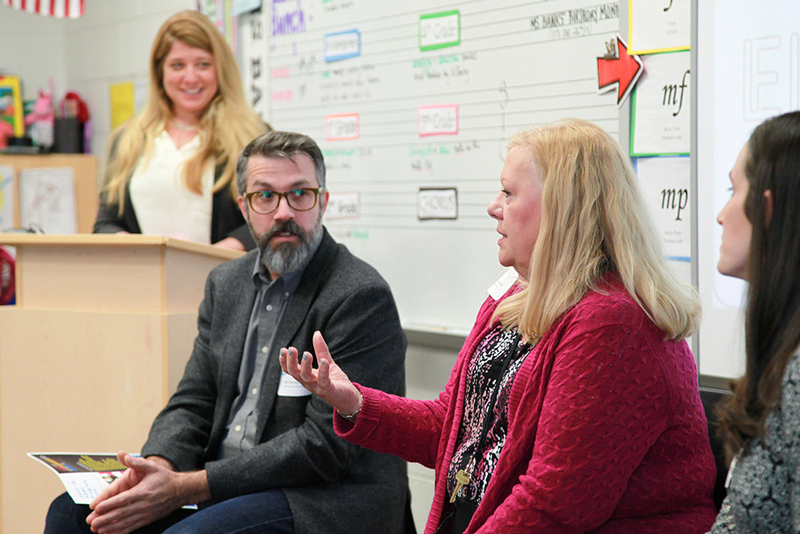 This creates a unique opportunity for the school to serve as a beacon for arts engagement, not just for high school students, but for the whole Northern Anne Arundel County community. NCHS is already home to a variety of performing band and orchestra ensembles, and offers students the opportunity to become involved in a number of in-school and after-school arts activities. “The medium of music is a fantastic way to teach some wonderful life lessons as part of the comprehensive program at North County,” wrote NCHS Music Director Theresa Bange on the school’s extensive music program’s webpage. The school climate encourages a culture of respect for the arts in its many forms. NCHS has also shown a commitment to innovation, offering special programs including the STEM (science, technology, engineering, mathematics) Magnet Program, the IT3 (International Trade, Transportation, and Tourism) Program, and the Early College Access program. This year, the high school will participate in several arts-integrated opportunities where artists will professionally deliver instruction through the arts. Math Department chair Amy Goodman is leading the charge of integrating the arts at North County High. She is currently coordinating a residency developed by YA artist and spoken word poet Femi the DriFish in collaboration with the school’s Algebra 1 team as well as collaborating with theatre artist, storyteller, and YA roster artist TAHIRA to develop a residency through the Teaching Artist Institute (TAI). Also through TAI, 9th grade algebra teacher Sarah Dobry is collaborating with steel drummer, Kevin Martin, integrating music with the curriculum! We are looking forward to sharing the collaborative work of YA artists and educators in arts integration at North County High School over the next few months and for years to come. The Arts Empowered Minds Initiative is the combined effort of many groups and individuals seeking to build a movement for increased equity through the arts in their community. With funding from the NEA in 2016, we built partnerships with Anne Arundel County Public Schools (AACPS), Chesapeake Arts Center (CAC), Arts Education in Maryland Schools Alliance (AEMS), Arts Council of Anne Arundel County, and University of Maryland – Baltimore County (UMBC). smARTbeats returns to WTMD this Saturday, July 8, during the weekly children’s music program Young At Heart. On this month’s smARTbeats segment, Young At Heart host Lisa Mathews sits down for a chat with Bomani. A seasoned performer, teaching artist, Director of Poetry Events for the Busboys and Poets restaurants, CBS Radio personality, and head audio-engineer for Urban-Intalek Studios, Bomani describes himself as a poet with a Hip Hop style. 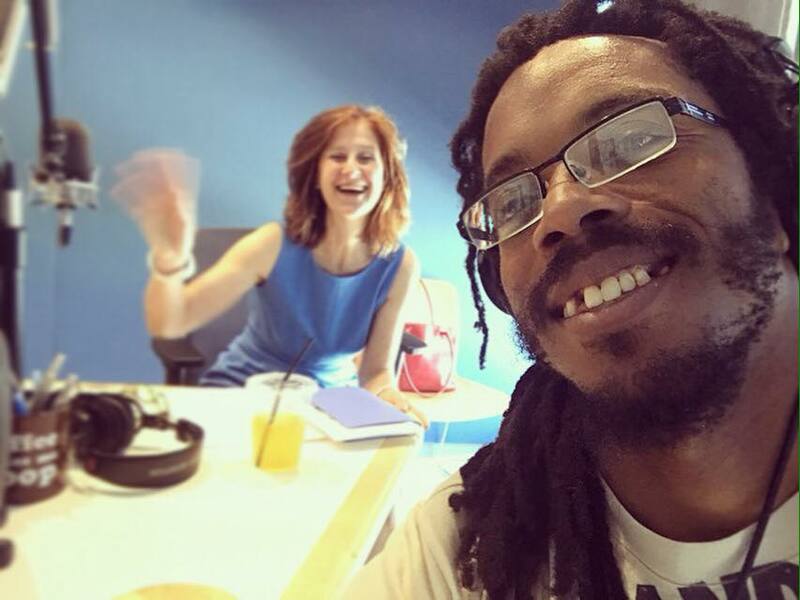 Bomani in the WTMD studio with host Lisa Mathews. During the segment, you’ll get a taste of Baba Bomani’s Hip Hop poetry as well as hear about his experience in the classroom. The artist teaches creative writing and prose through the exciting world of Hip Hop songwriting. By first creating a fearless, supportive and collaborative environment, he instructs children to use elements of creative writing including simile, metaphor, and rhyme to structure a song written in the pattern of a well-written essay. “Young people need to have freedom to develop an idea out loud without self-doubt and to not fear right or wrong answers,” Bomani says. 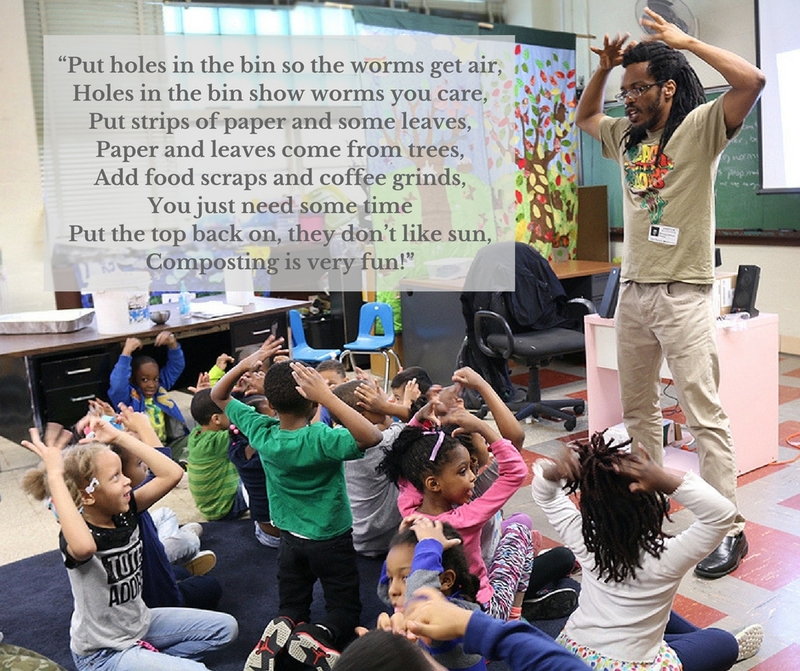 Kindergarteners in Prince George’s County Public Schools wrote poetry with Bomani as part of the district’s Growing Up Green initiative. Young At Heart airs weekly from 7 to 8 am on Saturdays, featuring music that appeals to parents and children alike. Previous shows have featured music by Wilco, David Bowie, Andrew & Polly, Weezer, and others. Hear YA teaching artist and composer Bomani online now! With Black History Month upon us, we celebrate the contributions, activism, culture, and experience of African Americans. 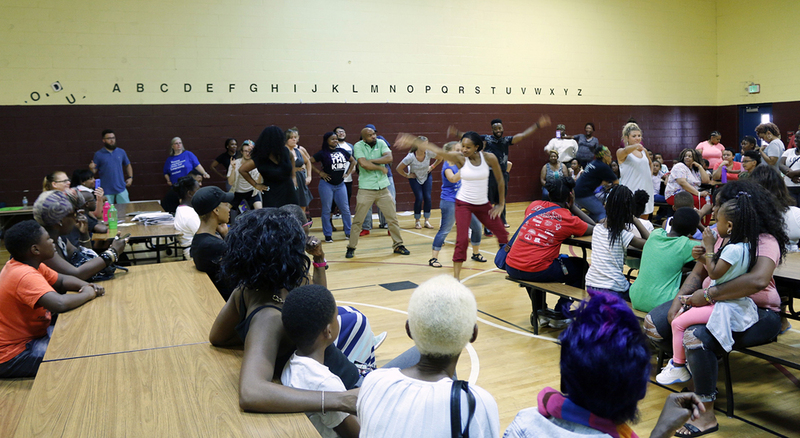 Many of our artists at Young Audiences have designed performances and assemblies to connect students with African American history and develop an in-depth understanding of the unique stories, struggles, and accomplishments of the past and the present. The following are just a few of the many talented artists available to bring a meaningful connection to African American history into your school. 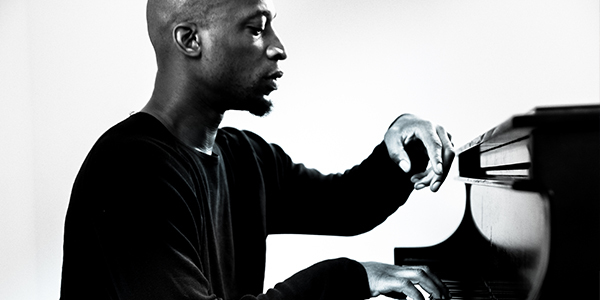 Kevin Gift introduces renown jazz pianists from Thelonius Monk and Art Tatum to Keith Jarrett in his assembly, Jazz Piano Masters. Students learn not only about the important contributions these musicians made to American music, but they also experience how improvisation can make practicing anything more enjoyable and personally satisfying. 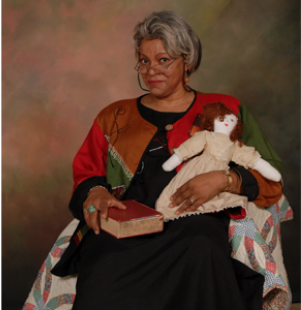 Debra Mims has been an actress for over thirty years and was an arts producer at PBS for fourteen years. With additional training in dance, she received a BFA in Theatre Performance from Marygrove College in Detroit, Michigan. She has performed at the Georgetown Theatre Company, the Children’s Theatre in Madison, Wisconsin, and the Detroit-Windsor Dance Company. In My Grandmother Told Me: A Tribute to African-American Women, Debra uses monologues, poetry, and song to tell tales of days past and of courageous Black women and their struggles to be free, to vote, and to get an education. 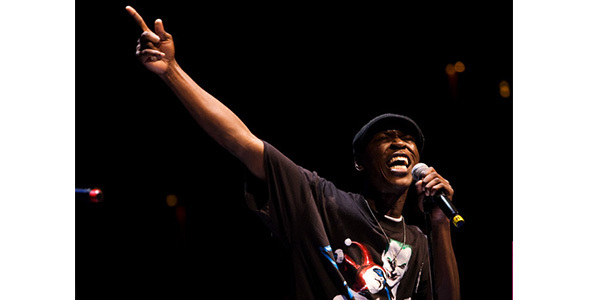 Professional spoken word artist and slam poet Femi the DriFish uses his artistry to encourage his listeners to discover their own unique voices and identities in his writings, performances, and teachings. His poetry performance, Write On, Then Say Word! is a spoken word/slam poetry journey through the various reasons to write and perform. Throughout the assembly, Femi shows students that they can draw subject matter for poetry from their identity and history. Schedule artists and programming to celebrate Black History Month by visiting our website. Baltimore City Public Schools students who participated in a new arts-related summer academic program from Young Audiences avoided summer learning loss and, in many cases, gained ground on their national peers in standardized testing, according to evaluations released Tuesday. The new findings showed potentially groundbreaking progress in tackling summer learning loss, a chronic challenge facing public schools. 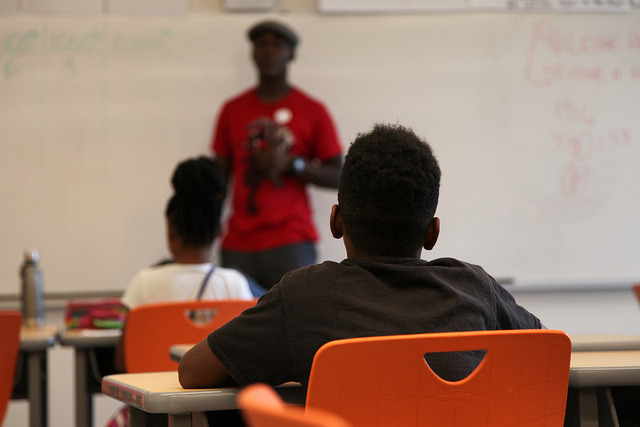 The results, confirmed in two separate studies involving nearly 800 students, are significant because summer learning loss – particularly among students at or below poverty level – is among the most difficult challenges facing the Baltimore school district and other high-poverty schools across the country. During summer, students typically fall below where they ended the previous grade, setting them back as they start a new school year. In fact, a 2013 National Summer Learning Association (NSLA) survey of 500 teachers found that 66 percent reported the need to spend three to four weeks re-teaching students course material at the beginning of the year. Another 24% reported the need to spend five to six weeks doing the same. The Young Audiences Summer Arts & Learning Academy (SALA), run by the Baltimore-based arts-in-education nonprofit Young Audiences of Maryland in partnership with City Schools, was free for students and held at four sites across the city: Gardenville Elementary, Thomas Jefferson Elementary/Middle, William Pinderhughes Elementary, and Fort Worthington Elementary/Middle. Eighty-eight percent of the participating students were from high-poverty Title I schools. For math, statistically significant results showed that students in grades 3-5 who regularly attended (defined as attending at least 75% of the program) the SALA improved 1.8% percentile points in national student rankings on i-Ready standardized testing from the spring of 2016 to the fall of that year. That compares to a decrease of 2.8% percentile points for city schools students who did not attend any summer programming. In reading, SALA students in grades 3-5 with regular attendance fell only .8% percentile points while students who did not attend any summer programming fell 2.1 percentile points upon returning to school in the fall. Results for all grade 3-5 students regardless of attendance rate showed SALA attendees falling just .3% percentile points in math and .7% in reading. These were significantly smaller losses than students with no summer programming (down 2.8% in math, down 2.1% lost in reading). In literacy, only 3% of the students in grades K-2 attending SALA did not meet their benchmark goal (the empirically derived target score that represents adequate reading progess1) on the standardized DIBELS assessment in the fall after returning to school compared to 8.1% of students not attending any summer programming not meeting the benchmark. 79% of students who attended at least 75% of the program and who took pre- and post-tests had a positive change from the first to the last week of the program on a curriculum based measure of mathematics. Approximately 60% of students who attended at least 75% of the program and who took pre- and post-test writing prompts showed positive change in their structure and content of their writing. 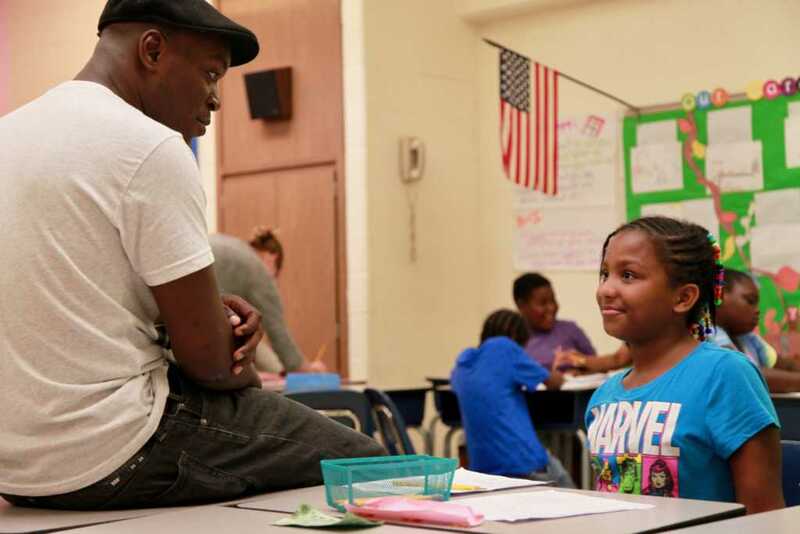 71% of students who attended 75% of the program and were administered pre- and post-assessments showed growth in at least one out of three social emotional competency areas over the course of the program. The social emotional competencies studied were relationship skills, self-awareness, and goal directed. “The arts offer an extraordinary opportunity, particularly during the summer, to reignite the joy of learning and to set young people on the right course to start the school year strong. These impressive results from Young Audiences mirror findings of the landmark Wallace Foundation study showing that elementary school students with high levels of attendance in high-quality, voluntary summer learning programs can experience benefits in math and reading,” commented Matthew Boulay PhD, National Summer Learning Association founder and interim CEO. 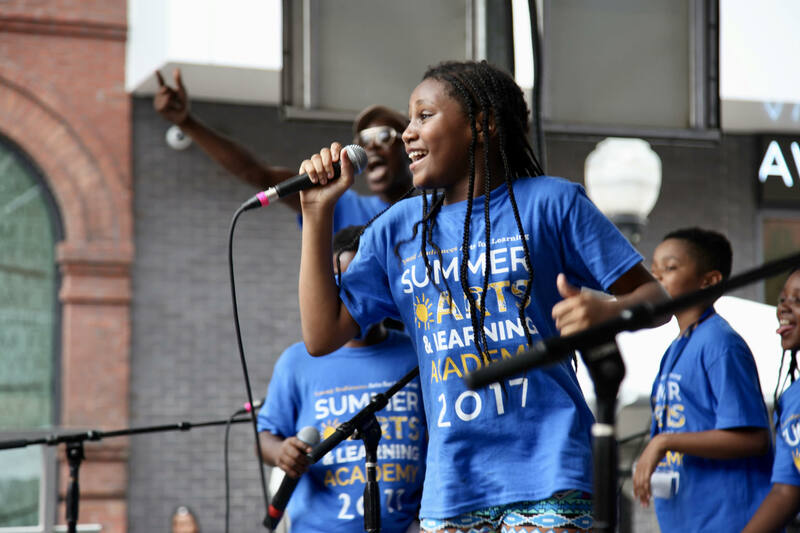 Young Audiences’ Summer Arts & Learning Academy is funded by Baltimore City Public Schools, The Abell Foundation, The Family League of Baltimore with the support of the Mayor and the City Council of Baltimore, The Alvin and Fanny B. Thalheimer Foundation and individual contributions to Young Audiences. All participants are students at a Title I Baltimore City Public School. Skher Brown and the Capoeira is Culture Performers teaching students Capoeira Angola, an African-Brazilian folk art that combines martial arts, dance, play, music, and performance. 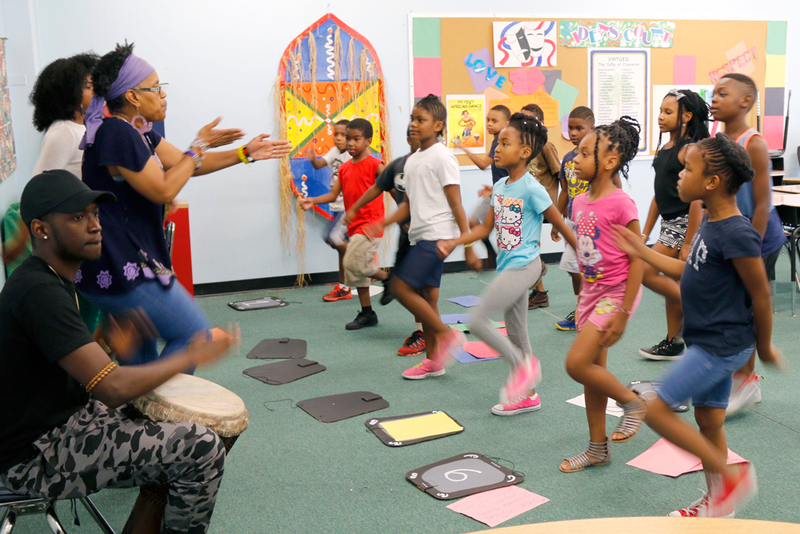 During Skher’s MSAC-supported residencies at Archbishop Borders School, The Pathways School – Edgewood, and Francis Scott Key Elementary, students will learn to use the movements of their bodies to create, communicate, and collaborate. 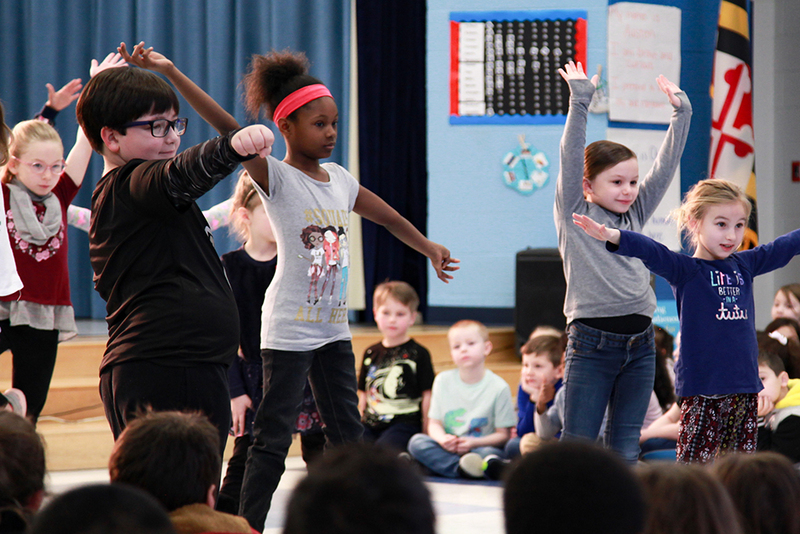 107 Maryland Schools Partnered with Young Audiences to obtain funding for Arts in Education Residencies through the Maryland State Arts Council Arts in Education initiative. At Young Audiences, our philosophy is simple: the more arts-integrated learning experiences we can provide Maryland students, the better. We are thrilled to be doing just that with help from the Maryland State Arts Council (MSAC) 2017 grants! We teamed up with 107 Maryland schools to write MSAC Arts in Education Initiative grant applications and secure more than $124,000 in funding for Young Audiences artist-in-residence programs in the coming year. MSAC grants help fund up to 30% of the cost of a Young Audiences residency program. With 194 total MSAC grants distributed this year, more than half were secured with support from Young Audiences! We couldn’t be prouder. And the fit couldn’t be better. 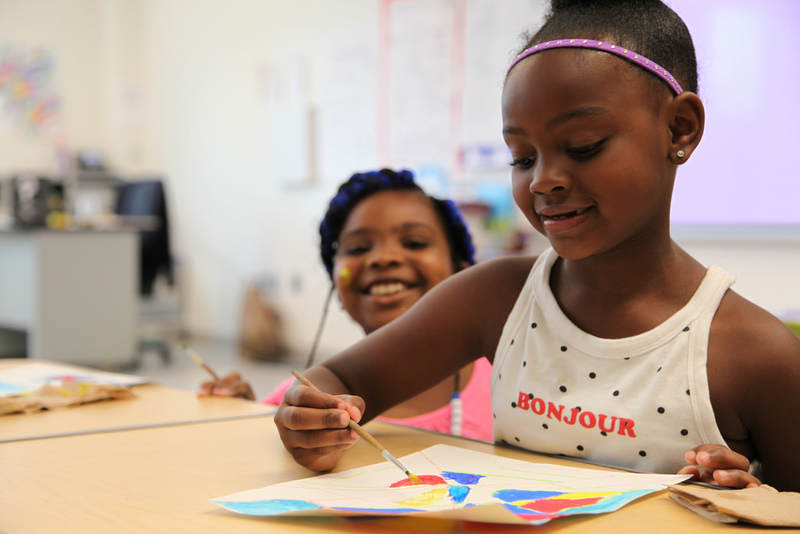 Like Young Audiences’ mission, the MSAC Arts in Education initiative is designed to promote, strengthen, and enhance the arts and arts education in Maryland’s elementary and secondary schools. 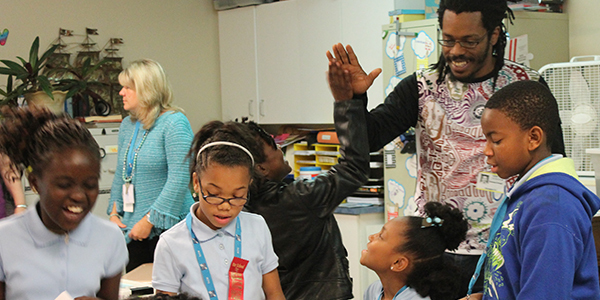 The grants will help fund Young Audiences artist-in-residence programs which bring professional teaching artists into classrooms to work alongside teachers and students. Teaching artists integrate their art form into the curriculum with hands-on, intensive arts workshops that engage students in creative experiences and bring joyful learning into the classroom. 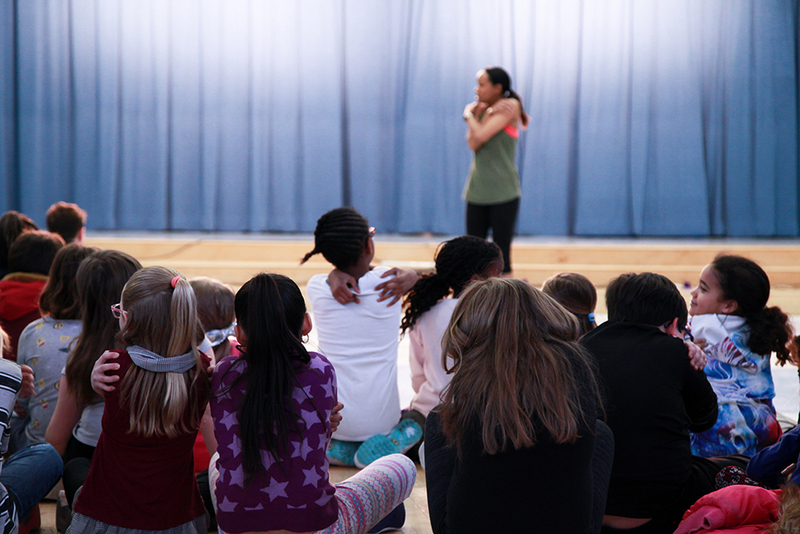 The Young Audiences residencies resulting from these MSAC grants will be found in private, public and charter elementary, middle and high schools in counties that include Baltimore City, Baltimore County, Anne Arundel, Dorchester, Harford, Frederick, Montgomery and more. The art forms vary too, including residencies focused on dance, poetry, improv, steel drums, theater, music, sculpture, and photography. For a full list of MSAC-funded Young Audiences residencies, click here. To learn more about Young Audiences artist-in-residence programs, click here. 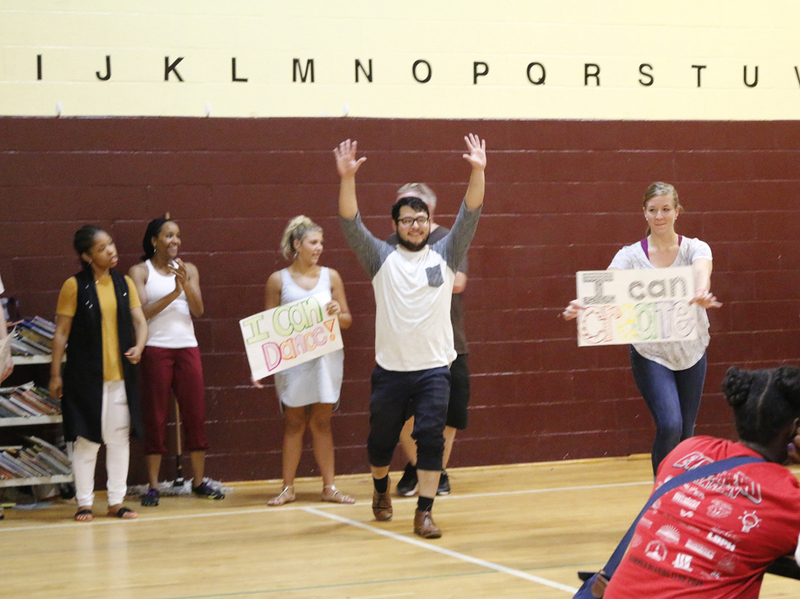 YA’s Expanded Summer Arts and Learning Academy Kicks Off Today! This morning, we kicked off our expanded Summer Arts and Learning Academy – a free, five week program immersing 900 City students in a variety of art forms taught by 36 locally-based professional artists. The full-day program welcomes students grades K-5, encouraging imagination, creation and expression through the arts, such as painting, songwriting, spoken word poetry, dance, piano, singing, visual art, sound production, playwriting, fiber art, and filmmaking. Our kickoff this morning was a blast – welcoming students and their parents to the Academy’s four sites with high-energy performances, live music, and vibrant interactive art demonstrations – giving them a preview of the truly unique and empowering experiences to come throughout the next five weeks. 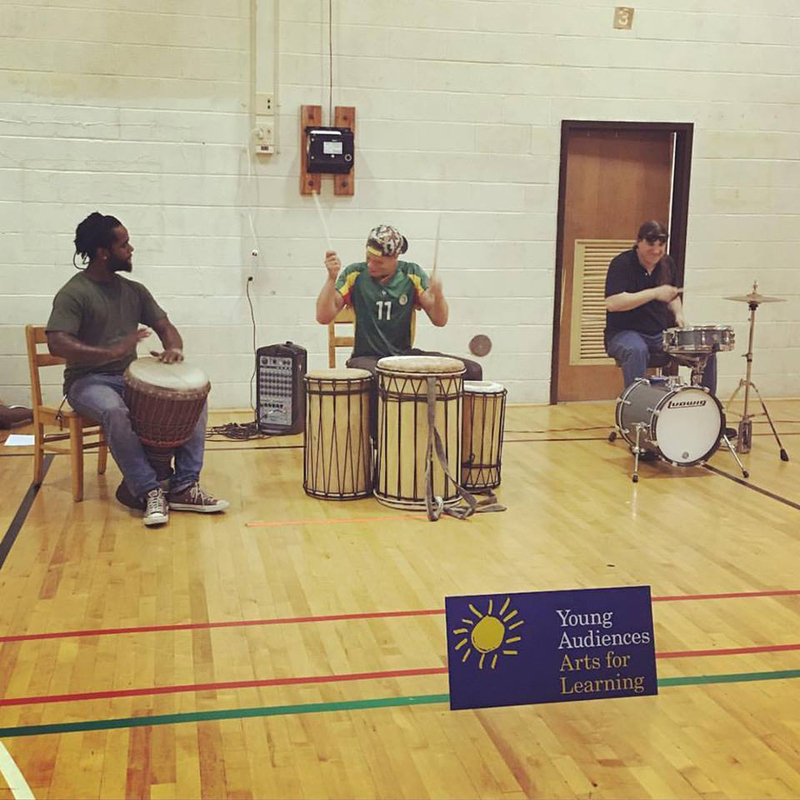 Sankofa with YA roster artist and percussionist Steve Cyphers (far right) kicking off the Summer Arts and Learning Academy at Fort Worthington Elementary School. Due to last year’s success; with academic gains by students drawing from 93 different city schools—the district asked us to expand the Academy to four sites: Thomas Jefferson Elementary, William Pinderhughes Elementary, Gardenville Elementary and Fort Worthington Elementary. 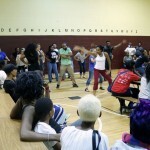 YA roster artist and professional dancer Valerie Branch (left) leading the kickoff at William Pinderhughes Elementary. 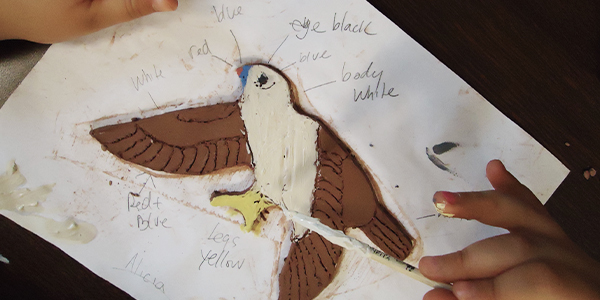 Students will imagine, create and express themselves through the arts, with a chance to concentrate on two art forms. 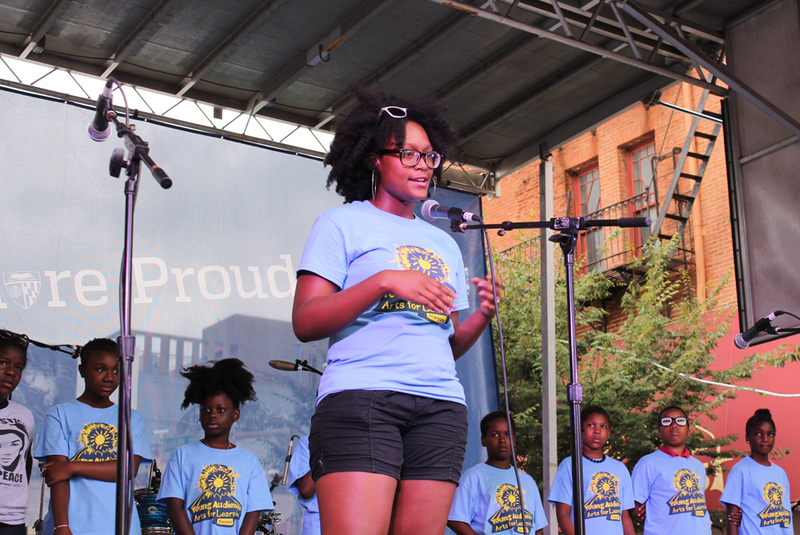 The students even show-off their talents at Artscape, at pop-up performances in mobile art galleries around the city and at the August 5 final culminating event. We can’t wait to see the students perform! 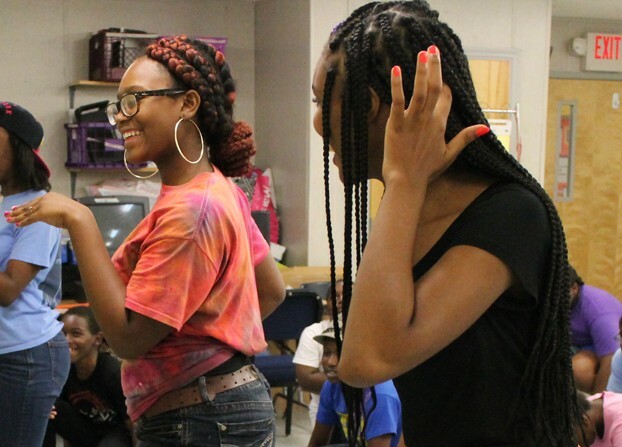 Young Audiences’ Summer Arts and Learning Academy is funded by Baltimore City Public Schools, The Abell Foundation, The Family League of Baltimore with the support of the Mayor and the City Council of Baltimore, The Alvin and Fanny B. Thalheimer Foundation and individual contributions to Young Audiences. All participants are students at a Title I Baltimore City Public School. 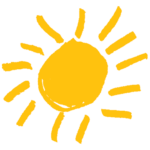 Learn more about the Summer Arts and Learning Academy. My name is Ken’Niya Baltimore. I am 13 years old and in the 8th grade at Henderson Hopkins. During the summer, my mother told me that I was accepted into Young Audiences’ Summer Arts Academy. My face was puzzled because I had no idea I was even signed up. But after I started to learn more about the program, I could not wait for it to start. Before it started, I would take my 5-year-old sister to school and come home. My father was at work, my mother was in school, so I was at home alone, watching TV, bored out of my life. Before I started the program I did not know there were celebrities here in Baltimore that should be in Hollywood with Taraji P. Henson or Beyoncé — artists like Femi the DriFish or Black Root. These were my teachers! When I first arrived at the Academy I did not want to talk out a lot or share any ideas that I had in groups. I took poetry, theatre, and hip hop dance. In my hip hop dance class, I had to dance differently in front of the class which I was not comfortable. I had to realize that I need to get myself together and be more confident. Confident. That word helped me out a lot. In all the classes I took I had that word in my mind — I kept telling myself that I can do it. I can do it just keep going. In dance class, I told myself I cannot do it, but I knew that, in life, I will always have to try something new so I danced a solo at the Academy’s final performance! My poetry class was my favorite. Femi the DriFish was my favorite teacher because he helped me a lot through my writing by giving me examples and showing me his awesome poems. 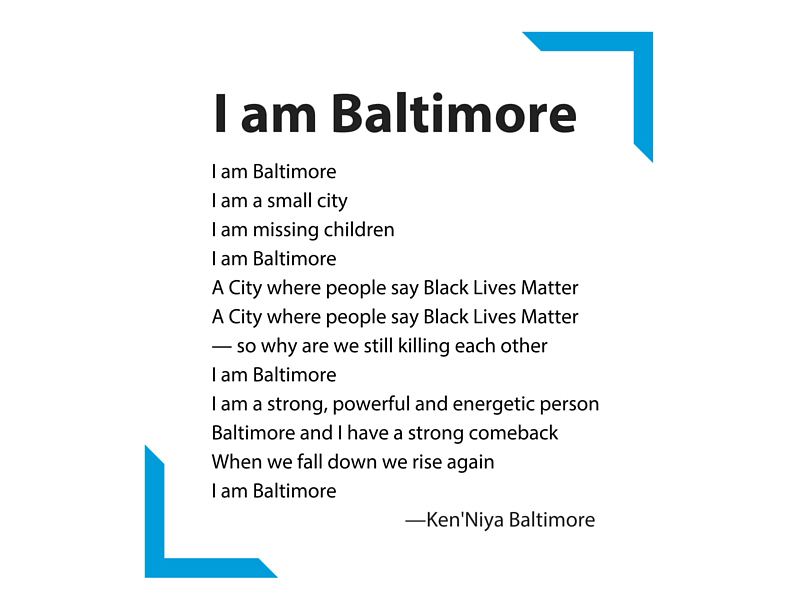 The most challenging and rewarding thing I did in the Academy was my poem “I am Baltimore.” It was emotional because of what was going on my city. I wanted to quit and switch classes but I realized I was the oldest in the class and the younger kids were having the same problem. So I told myself if you quit, they will too. So I pushed myself and everyone else, and made sure we were organized and ready to perform. I performed that poem at Artscape. When the program ended I did not want to leave. I wanted to cry and stay longer. I asked the teachers, “Can I come back next year and help as a youth worker?” I already knew that wasn’t an option because I would be in the 9th grade and too old for the program, but I told my parents I would find a way to get back there. This experience has impacted my life so much. I now feel great about speaking to a crowd. I feel confident about my tomorrow. I am going to attend City College or Baltimore School for the Arts. I am going to be an actress, writer, producer, and lawyer…and maybe in my spare time a singer. I hope many kids have the same experience I did at the Summer Arts Academy; it will change their lives too. I have been with Patterson Park Public Charter School for six years in various teaching positions in Title I, third grade, the English for Speakers of Other Languages (ESOL) program, and am now the school’s arts integration coach. This year has been a learning process, but also such a positive experience working in partnership with Young Audiences and Arts Every Day. It was a personal goal for me to transition Patterson Park Public Charter School into becoming an arts-integrated school. I wanted to maximize our artist-in-residence programs with outside artists as much as I possibly could this school year. 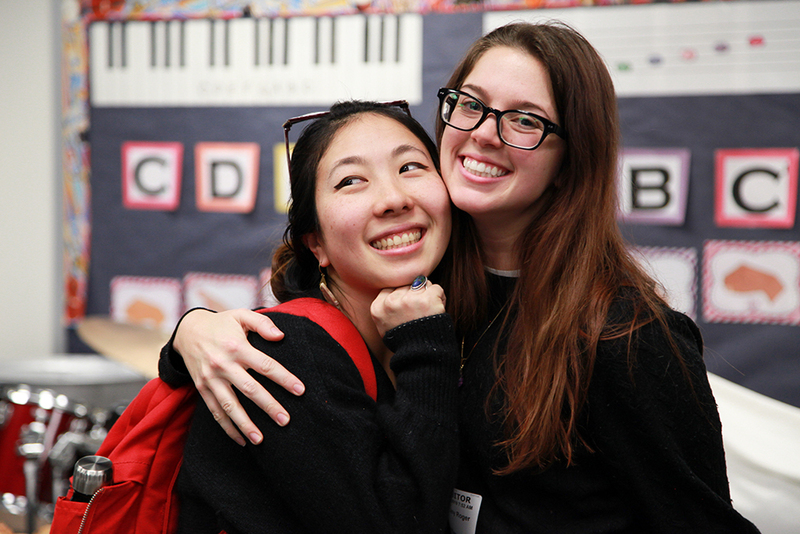 We believe in the strength of the impression that residencies make upon students and teachers. All of the work that comes out of a residency versus a day-long field trip makes such a difference. Residency programs allow students more time to engage with and learn from the artists. This exposure to artists is also important for the teachers because it provides a longer period of professional development so that they can learn skills and strategies that they can carry out in the future. 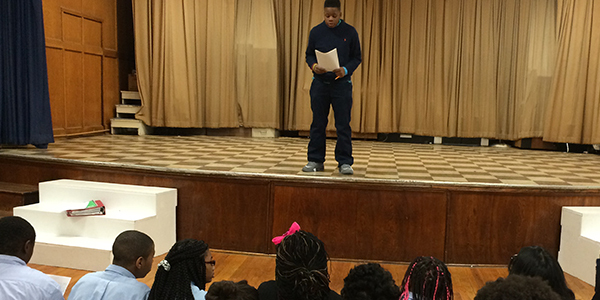 One student performs a poem for his peers as a part of the residency program with Young Audiences spoken word poet Femi the Drifish. We had a fantastic variety of Young Audiences artists out to our school this year. These artists included: spoken word poet Femi the Drifish, ceramic visual artist Amanda Pellerin, Baltimore Improv Group, Flamenco dancer Anna Menendez, and more. These programs were made possible through Access for All grant funding from Young Audiences and funding from Arts Every Day. We spread the residency experiences across different grade levels of the school. It was very helpful having the Young Audiences artist and program information online because it allowed me to search for artists that matched and linked to the content areas that our teachers were looking for. Femi the Drifish worked with our middle school students in Language Arts. A great thing about that residency was the response we received from students who typically are not comfortable with performing in front of people. By their culminating performance, those students in particular were the ones to stand up and share their poetry with strength. Third-grade student painting a mosaic tile which was added to the final mural depicting what the class had learned about Ancient Egypt. 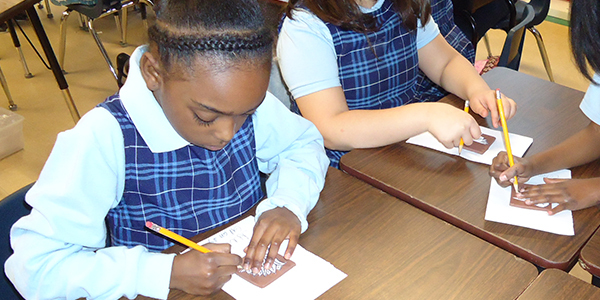 The third grade worked with Amanda Pellerin to create an Ancient Egyptian mosaic. This piece of work related to their study of the ancient civilization. Mr. O’Connell, our third grade science and social studies teacher, was blown away by how Amanda challenged the students to do their best work in a really positive way. We’re very excited to have that piece of artwork as a permanent fixture in our school. Anna Menendez brought some of the Spanish culture into our school. Some of our middle school students had just returned from a trip to Spain during spring break, so this residency was another way to connect with what they learned and saw on their travels. It also provided a relatable experience for the students who didn’t have the chance to travel to Spain. I have personally seen the impact that residencies have had upon teachers compared to other arts-related experiences. I believe that having artists at Patterson Park helped our teachers develop a great deal. Artists exposed teachers to new art forms that they may not have had any experience with, such as spoken word poetry or improvisation, and gave our teachers opportunities to learn how to tie these art forms to the curriculum. One of our charter school philosophies is that children learn best through hands-on activities with interdisciplinary and semantic learning models. 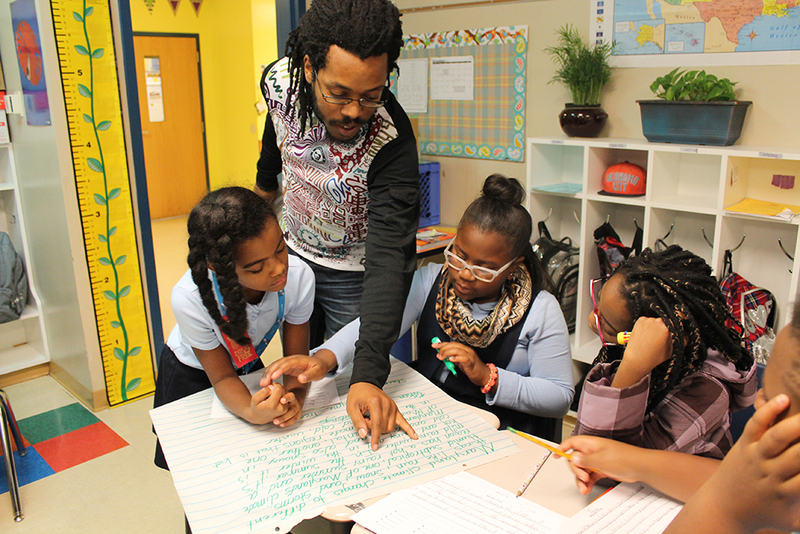 Arts integration is at the core of our values and it naturally makes sense for Patterson Park.